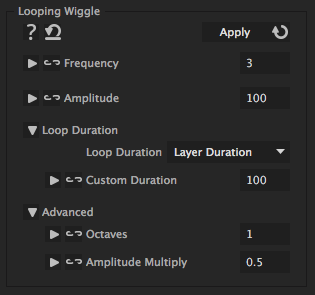 The looping wiggle allows wiggeling in cyclic animations (loops) and takes care that it wiggles such that the transition between the end and the beginning of the loop is seamless. determines whether the loop duration should be taken automatically from the duration of the layer or be set manually via 'Custom Duration'. The duration of the loop in frames (if the option 'Custom Duration ' has been chosen for 'Loop Duration').